Mussels marinières is a famous dish in France. 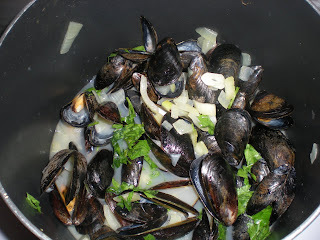 This is commonly known as Sailor's mussels, or even plain mussels in white wine sauce. The dish basically consists of delicately steamed fresh mussels in a white wine, garlic, parsley, butter, onion and sometimes cream sauce. This can be served as a starter or even a light main meal. The French traditionally serve it with French fries, which they dip into the juices. 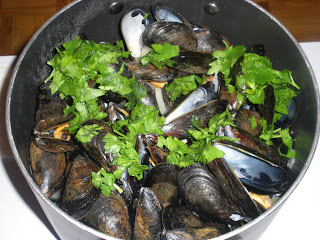 To clean properly mussels, check out this link on allrecipes. 1. 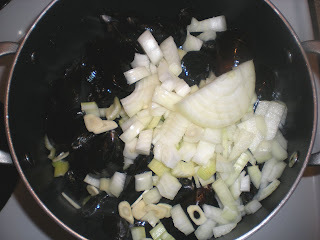 In a soup pot, place mussels, onion, celery, garlic, and white wine. 2. 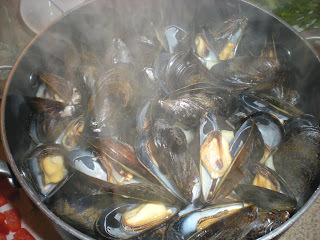 Cook over medium heat until mussels have opened. Stir frequently. 3. Add pepper to taste. Stir in butter and top with parsley before serving. 4. Serve with french fries as would traditionally or over rice with the juice. July 24 news : On foodbuzz.com, the top 9 posts are chosen based on the activity from the previous day. It seems that my recipe is ranked 4 for this day. I'm very excited as my recipes had never been in the top 9. Thanks to everyone that had buzzed and viewed. For those who are unfamiliar of foodbuzz, here is the picture of the top 9. A true classic. Quick, easy and absolutely delicious. And it's fun to eat, too! Love it. I'm French and I have to say that your recipe makes me hungry! Well done! 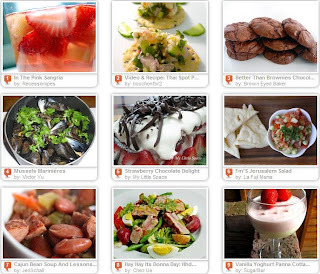 Joining food blog is a great way to get inspired and get some diversity on the food we eat. One of my favorites. Definitely will try your recipe. Looks grand.